“The true standout of the evening was Sébastien Guéze’s Romeo. Guéze is an up-and-coming tenor from France and he has a spectacular voice with a crystal clear upper register. His voice has a power and beauty that is rarely heard. “The most Promising french tenor of the new generation. 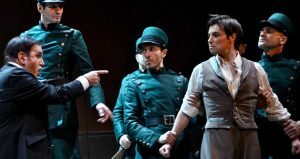 Sébastien Guèze, a charismatic bundle of energy as Rodolfo, proved very well that he was one of the warm and caring sort in an immaculately-wrought “Che gelida manina”.